A quick and effective way to enhance your smile. Teeth whitening has rapidly become one of the most popular choices of cosmetic dental treatment and can be one of the quickest and most effective ways to enhance your smile. As we age, our teeth naturally darken and our lifestyle choices of drinking coffee, tea or red wine for example, or bad habits such as smoking can also stain them. 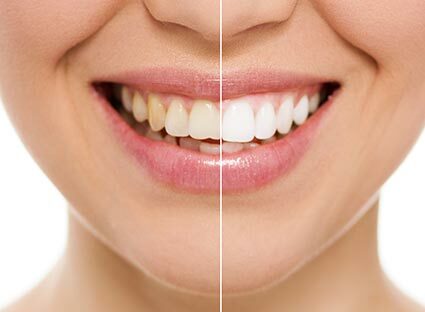 Teeth whitening can help to reverse the effects of aging and staining, giving you a sparkling, natural smile. At Bhawani’s Dental we offer the ultimate in tooth whitening - the Enlighten system. It’s the only teeth whitening system to be guaranteed to whiten your teeth to shade B1, regardless of the colour they were when you started. In-surgery whitening can give intense and noticeable results in the space of your lunch hour! A special gel is applied directly to your teeth and a UV light applied that reacts with the gel to quickly lighten the tooth colour, a process that takes only around 60 minutes. Home whitening kits can be supplied for you to whiten at your convenience. Impressions of your teeth are taken and special customised trays are made. These trays are filled with a special whitening gel and worn for specific periods during the day or night for long-lasting, truly effective results. Teeth whitening is totally safe, pain-free, suitable for the majority of people, but should only be carried out by a registered dental professional. We always perform a thorough consultation before treatment starts to ensure teeth whitening is suitable for you. Do you want a whiter smile? Why not give us a call on 01925 768 111 and book your appointment today!